The Jones Agency debuts a new charity campaign in Marietta, GA to support The Multiple Sclerosis Center of Atlanta’s programs that assist those living with Multiple Sclerosis in the Greater Atlanta area. The Agency will direct raised funds to the Center to help fund education, advocacy, and treatment programs. We are very excited to work with this amazing organization in our community. With a new charity program in the Greater Atlanta, GA area, The Jones Agency has teamed up with The Multiple Sclerosis Center of Atlanta to support those living with Multiple Sclerosis, and announced that they will be raising funds to help support The Center’s educational, advocacy, and treatment programs. The Center exists to improve the health and hope of MS patients and many of them depend on the Center for its services. To support this wonderful organization, donations can be made at http://www.mscatl.org/donate.aspx. Utilizing its own resources and seeking the help of its own network of customers and business partners, The Jones Agency marches on to ensure customers, friends, family and neighbors are always in good hands. The agency launched their master charity program last year, which the current campaign is part of, electing every 60 days a new individual, organization or family in need to receive their support. “We are very excited to work with this amazing organization in our community. The Multiple Sclerosis Center helps so many patients who depend on their services for help,” said Brian Jones, the Agency’s principal. 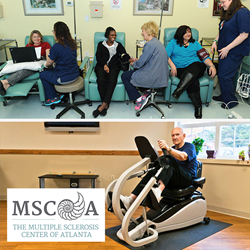 To join The Jones Agency in supporting The Multiple Sclerosis Center of Atlanta, donors are encouraged to visit http://www.mscatl.org/donate.aspx and share the page with their friends and family. Contributors may be acknowledged for their donations through the agency’s monthly magazine. Once the current campaign is over, The Jones Agency will continue to work closely with The Multiple Sclerosis Center and other nonprofit organizations in the area, to make sure resources are directed to capable hands that can help better the local community, one family or person at a time. Information regarding past and current campaigns supported by the Agency can be found at http://www.jonesagencygeorgia.com/community-cause. More information about The Jones Agency and The Multiple Sclerosis Center are available at http://www.jonesagencygeorgia.com/ and http://www.mscatl.org/. Serving from their office in Marietta, GA, The Jones Agency is committed to bringing local communities an insurance agency that understands their needs. Taking pride in its team of professionals, The Jones Agency has assembled a variety of products and services for its customers. From all of the products a typical consumer needs (home, auto, boat, ATV, etc.,) to all financial services products and tools (retirement, savings, long term care, disability, etc.,) and business insurance (liability, building, auto) to workplace and individual benefits (accident, critical illness, cancer, disability, life), The Jones Agency covers all the bases for insurance needs in the Georgia area. To reach a helpful representative at The Jones Agency, visit http://www.jonesagencygeorgia.com/ or call (770) 422-3205.